This Bloomsday Eve Rohan Healy and Godfrey Jordan present a three-hour event of music, screenings and discussion about their film-music collaboration for a new documentary series, to premiere at IMRO HQ. The major narrative arts converge in the James Joyce Documentary Project which explores the life, times and influence of the great Irish author. 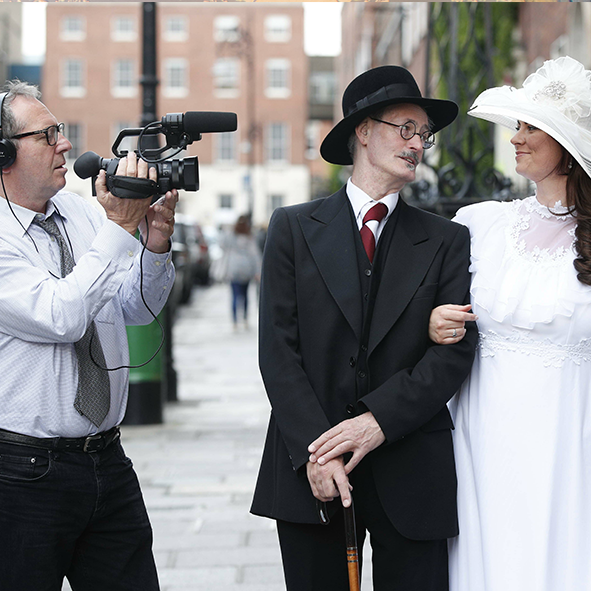 The event will include a screening of three short films: A Touch of the Artist about Old Bloom, Portrait of the Milliner as yer man himself and Bloomsday ReJoyce. The Dublin City Rounders will perform a few numbers following the screening. Godfrey will read a brief section from his novel The O'Credible Showband set in the long-ago demolished Eamonn Andrews Recording Studios on Harcourt St. And to make the occasion official, anticipate a visit by "yer man himself" Mr. John Shevlin, the official look-alike for the James Joyce Centre, Dublin.